Dear Election, please feck off, sick of you at this stage. Crackbird Addictive Chicken is JoBurger’s take on fried chicken. Popup restaurant in 19 Crane Lane, Templebar. Tweet “#tweetseats @crackBIRDdublin your name, reservation date & time and no. of people” If they have availability #tweetseats eat for free. Free! In a silly move the Beeb removes websites to save money. So someone made an archive and torrented them. Business World have released a traditional and online media monitoring service. Free trials too. Preparing for your HPAT? A guide from Tosu. An example of bad SEO and JC Penney is uncovered but the post by Vanessa Fox highlights legit techniques and tools you can use. Nail on head. Sales people are crucial for any company. Run and designed by engineers generally means you’ll never release something. 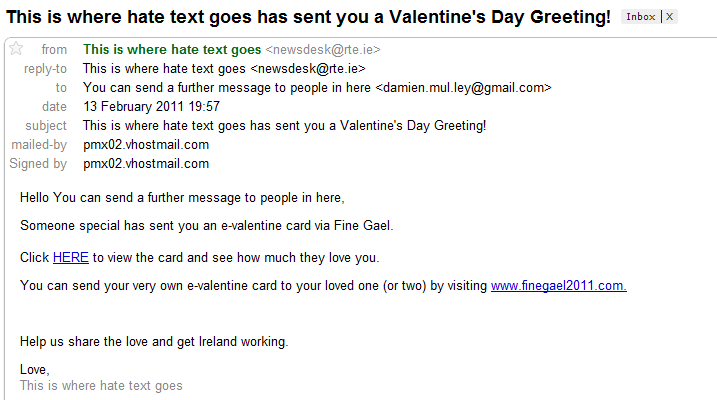 Lot of Irish political parties into attack statements for the election. I’m doing a workshop and giving a talk at the Mash Conference in May. It will also be my last public talk for 2011. Measure It! is on March 2nd in Dublin. Also, what digital skills do you want from marketing/pr interns? WhoseView.ie now getting into the deals market. Good. Data mapped and trended based on nominations at the 2010 Blog Awards. Interesting but skewed perhaps! Congrats to Haydn Shaughnessy, now writing a blog for Forbes. Another reason why Google is fecking up more these days. 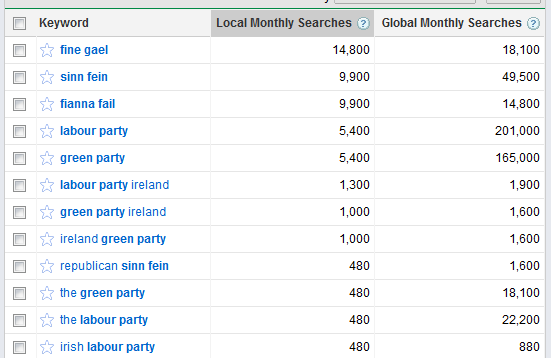 Using the Google Keyword Tool that shows you search trends it seems that when it comes to searching for party names in Ireland Fine Gael romps home with Sinn Fein and Fianna Fail joint second, Labour Party and Green Party joint third. This data is a few weeks out of sync so will change again right before the election. 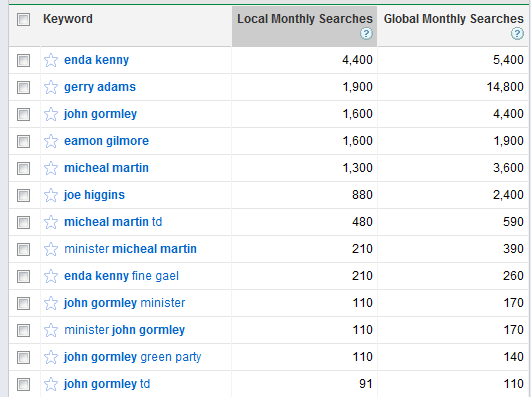 Enda Kenny, then Gerry Adams, John Gormley and Eamon Gilmore at same level, then Micheal Martin. There’s been a rush of late for agencies and marketing people embedded in companies to get higher numbers on their Facebook Pages to justify their time/money spent being all amazing social media ninja-y for clients. As long as systems are in place that reward people for numbers, gaming will happen. If you just look at numbers only as a company, you will get gamed by some agencies. It’s actually easy for a business or a model to get 100,000 fans on Facebook very quickly. Or 30,000 Twitter followers. Or even more traffic to your client’s website after you “worked” on it. Amazon’s Mechanical Turk is a computer to human being interface. You write a mini-program and it gets executed by human beings for a few pennies a go. The example of the 10,000 sheep a few years ago is great. In World of Worldcraft and other games you can hire people in net cafes in the developing world to gold farm for you: Play the game for hundreds of hours to build up you points in the game so you don’t have to. And so now we have the same for Facebook Fans, Twitter followers and so on. There are probably 1000s or 10s of 1000s of people in developing countries sitting in net cafes who are paid to create GMail acccounts, Facebook accounts and Twitter accounts and then are tasked to Fan or Follow accounts. Automated scripts can create traffic surges to sites or manual refreshes are done. All in the name of numbers. The same people who run dump and run spam campaigns are also hiring out their Fan services. It makes sense (if you are morally compromised), sad sense that agencies in Ireland are boosting their own numbers in order to tell prospective clients that they will use their huge followings to get them traffic and fans too. The trouble is as Facebook does their purges, all those zombie accounts are killed off and off you go and start again. Look at the Facebook Page without logging into Facebook. Is the Irish or UK company big in Malaysia and India? Look at the comments left on the Page, if any. I’m not pointing out the services but there are a lot out there where you too can avail. But hurry, the gaming has already moved on to Quora. No, really. Get real people. That should be the endgame. Find genuine fans, be genuine with them. That spreads faster than fakery. Sunday Business Post have a politics blog. Oh yeah. What’s the best social media tip you’d give to your political candidate/party? Nice debate for the Sligo/North Leitrim Constituency. The Big Ticket. Facebook Places Ireland launches. Quick take. LinkedIn Skills a response to Quora by enabling people to show off expertise. Want 15TB of storage for your GMail. You can get it.